Note: Prescribed weight for men is up to 95lb. and women 65lb. on the Deadlift and Hang Power Clean. There will be a 20:00 time cap on this workout. We will review all barbell techniques at the beginning of each class. This is a sweet session! Welcome to our new Krav Maga Santa Cruz Phase A Warriors! Phase A meets Monday and Wednesday nights from 7:15 to 8:00 PM. 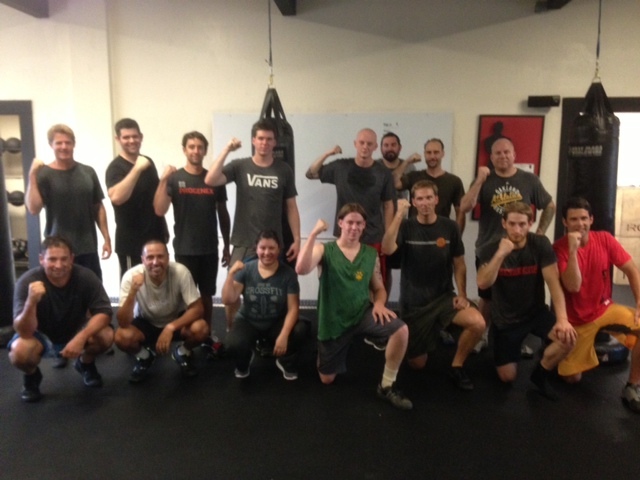 Training includes KravFIT conditioning workouts, combatives, Self Defense and Weapon Defense training, as well as the development of the Warrior Spirit. In October 2014, Phase A practitioners who missed no more than 5 classes will be eligible to test for Phase B. In addition to Personal Defense, Phase A will include a heavy emphasis on KravFIT workouts, and the development of a durable, resilient and strong body and spirit. Good luck to all the Phase A Warriors during the next three months of training. The next Phase A will begin in Late October. Join Mark Divine and Greg Amundson as they talk about Greg’s start in CrossFit, thoughts on leadership development, Greg’s book Your Wife is Not Your Sister, his warrior development path and the goal of developing of a holistic wellness center in Santa Cruz, California.